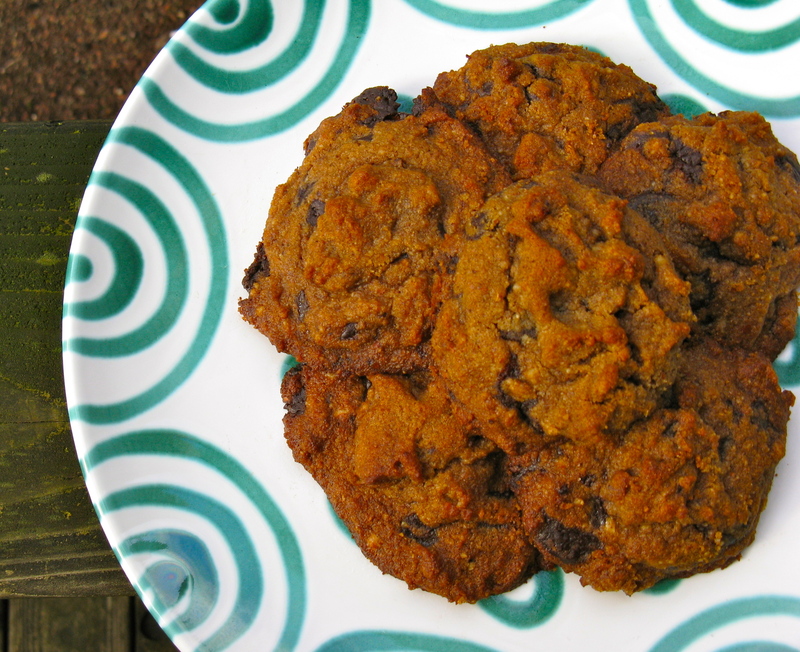 How have I not shared this recipe for chocolate chip cookies yet? Somehow, I’ve been holding it hostage! 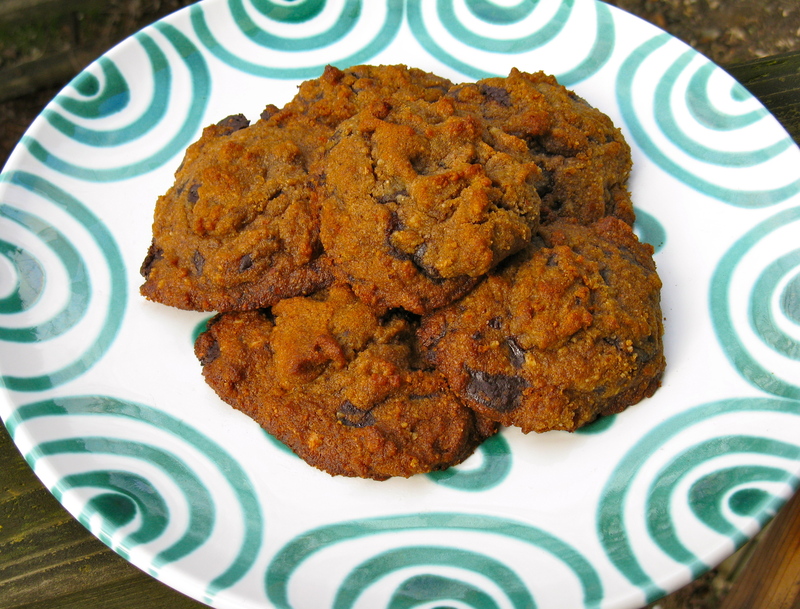 These cookies make a great treat and are grain-free, refined sugar-free, soft and not too sweet. These can be made dairy-free too. 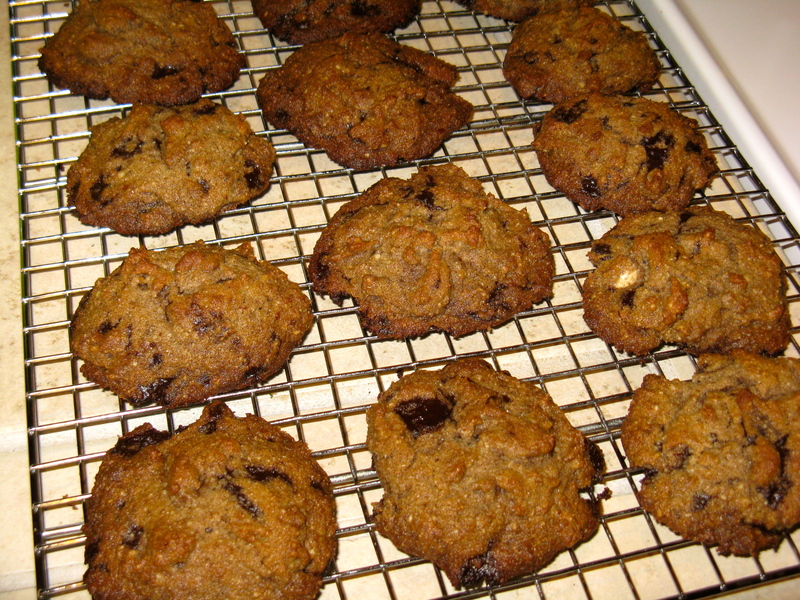 The thing that makes these cookies particularly special is the HOMEMADE CHOCOLATE CHIPS! Yes, you read that right…homemade chocolate chips! I don’t eat store-bought chocolate chips, even the Enjoy Life brand, because they contain sugar other than honey. I’ve learned that my system does fine with cocoa powder and unsweetened chocolate in moderation, but I’m not currently interested in testing other SCD-illegal things, like sugars (honey is the only SCD-legal sweetener). I don’t need or want it, and it probably wouldn’t make me feel very good. Preheat oven to 350 degrees F. Line a baking sheet with parchment paper or a nonslip baking mat. In a small bowl, beat together the eggs, honey, butter and vanilla. Stir wet ingredients into dry, mixing well. 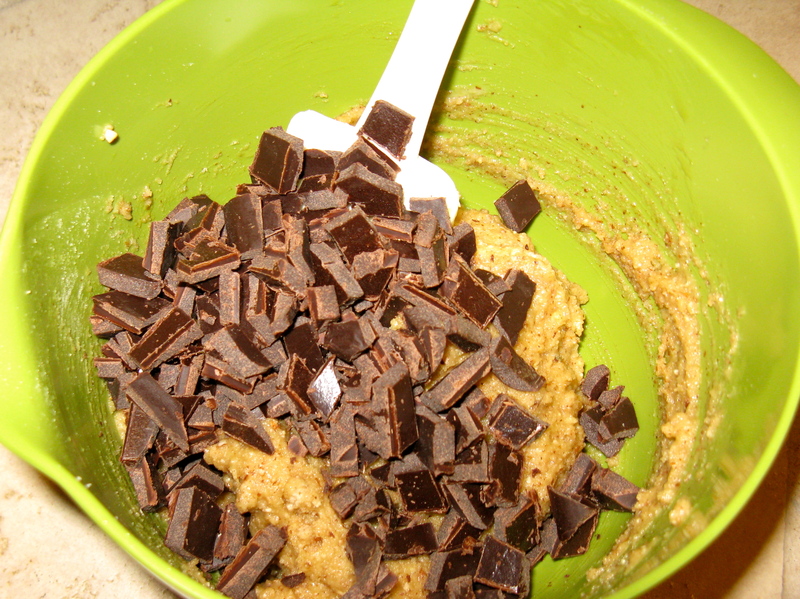 Add chocolate chips and mix to incorporate into the dough. Drop dough onto baking sheet with a tablespoon (mine were heaping tablespoon-sized). Space appropriately and if need be, split batter between two baking sheets. Bake for 10-12 minutes or until light brown. Let cool on a wire rack once done. Enjoy with a glass of almond or coconut milk, if desired. 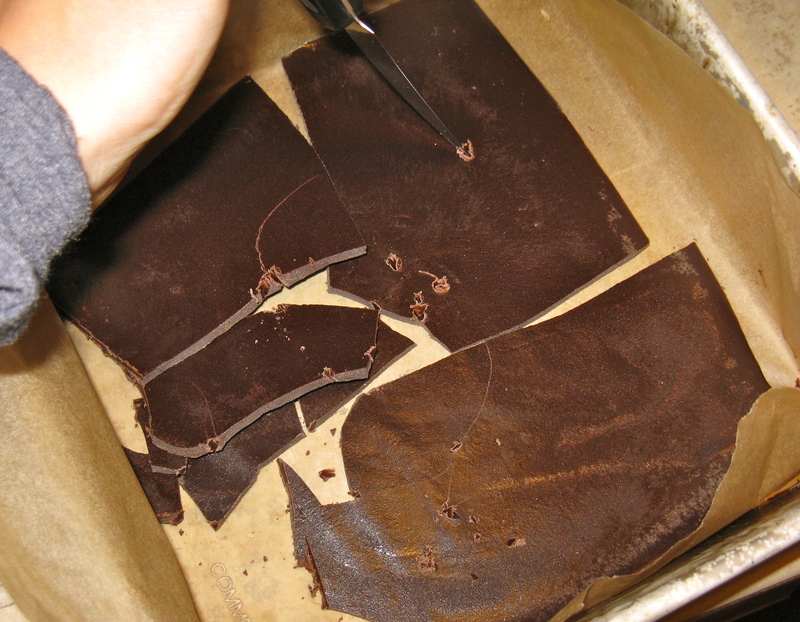 Breaking up the block of homemade chocolate. Combine all ingredients together in a small saucepan over medium-low heat. Mix together with a whisk until the mixture is smooth. Line an 8×8 pan (or baking sheet) with parchment paper. Pour mixture onto parchment paper and place pan in the freezer to set. Freeze for 2-3 hours or until completely hard. Once set, break into chunks with a knife. Store chocolate chips in the freezer, until ready to use. These can be used just like regular chocolate chips. Oh my word, those look like heaven! Thank you for this. I have really missed having chocolate chips for my sweets and I am going to make this tonight! Yum! Wonderful! Thanks and I hope you enjoy the chocolate chips! They’re better than any store bought version I’ve ever had! I love the homemade chocolate recipe!! I’m definitely bookmarking this one. I hear ya…I try not to make them a regular thing too. Sometimes, I blame it on my blog because treat recipes are pretty easy to come up with, but really it falls back on me! That’s true! I just have zero self control when it comes to these things! Ditto! I eat one or two and keep wanting more. I cna’t believe you made your own chocolate chips. I love the idea and can’t wait to try it! I’d also love to make homemade chocolate almond milk without the added sugars. Yum! If there’s a will, there’s a way 😉 Making homemade chocolate almond milk would be super easy! Do you ever make homemade plain almond milk? If so, just blend some unsweetened cocoa powder with your nuts and water, and maybe a little pure vanilla extract. If needed, sweeten with some dates or a little honey. If you don’t make your own almond milk, I recommend giving it a shot, as long as you have a high-powered blender. Thanks! I have never made my own but am interested in giving it a try. I have a new blender (although not the vitamix that I want) and a food processor so one should work…right?! Do you ever use Cacao powder? I use it in smoothies and love it but didn’t know if I could use that instead of cocoa in the chcolate or chocolate milk recipe. Thanks for taking the time to reply! Have a great night! Use your blender, not the food processor! You’ll end up with a liquidy mess in the food processor. Yes, I sometimes use raw cacao powder, but most often, just use regular unsweetened cocoa powder. Either will work, but cacao tastes a bit stronger, at least to me. It also keeps me from falling asleep if I consume it in the evening, but I don’t notice that problem with regular cocoa powder. To make your own, just soak 1 cup of almonds for 24 hours. Then, drain and rinse thoroughly. Add to your blender with 3 cups of filtered water. Now is the time to add any vanilla, cocoa powder, dates or sweetener. Blend on high for several minutes. Then pour into a nut milk bag and drain over a bowl. Once done, pour into a jar/pitcher and store in the fridge. Those look and sound amazing and I am without sugar -period- for a month. Man. Hmmm…not really sure what happened, but I’m sorry that they didn’t turn out. You didn’t change anything in the recipe, did you? Did any of the cookies turn out? I didn’t! I didn’t flatten them on the sheet at all, just left them as balls as I usually do, so I have 12 little balls but hardly any chocolate! hehe. I’m just getting used to serious baking without grains. Should I have flattened them or would it not have made a difference? Thanks for your help! Baking is always tricky! If you followed the directions and ingredients to a T, then I really don’t know! But, sometimes these things happen, unfortunately. Some of my chocolate got a little melty into the cookie, but most of my chocolate stayed in-tact in this recipe. Also, no, you don’t want to flatten the cookies for this recipe, which is why I don’t mention flattening them in the directions. Maybe you’ll have better luck next time! I hope they still tasted good, despite their appearance! Only thing I can think of is the fat that you used. Did you use coconut oil and was it refined or not? The refined is liquid at room temp and so your chocolate base will also start to liquefy at room temp. Make sure to use regular coconut oil.